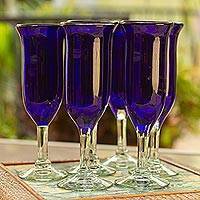 This 5 oz Plastic Chmpagne Flute (REFC1P5) by EMI Yoshi is a one-piece glass made from durable flawless plastic. The glass has a wide base to ensure stability and its single piece structure allows for easy service without the hassle of assembly. This 5 ounce model is the perfect size for a standard champagne serving and the clear coloring will allow it to fit in with any service. The strong composition of this glass gives you the option to wash and reuse it time and time again or dispose of it depending on your time and storage needs. This fancy detailed glass works beautifully for receptions weddings graduations and general bar service both outdoors and inside.